The Slim Gem motor starters sell for $2.75 each. The Slim Gem is designed for use in “H” through mid “J” RMS or single use high-power motors. They must have 12 volts to start. 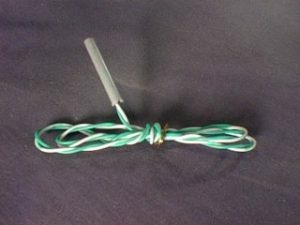 The pyrogen is 1 inch long by 9/64 inch (.140) OD with 24-inch leads and made to fit those smaller nozzles. Using 12 volts, the Slim Gem will burst into flames at 1,600 degrees F, producing much smoke and sparks. Rapid combustion then consumes the remaining pyrogen similar to a sparkler. They will reliably start sugar motors, composites, black powder or anything that will burn. Moisture and shock resistant. Slim Gem starters are most commonly used with club type 12 volt Launch Controls. Usually three can be clustered at once, ground test to be sure your launch control is up to the task.